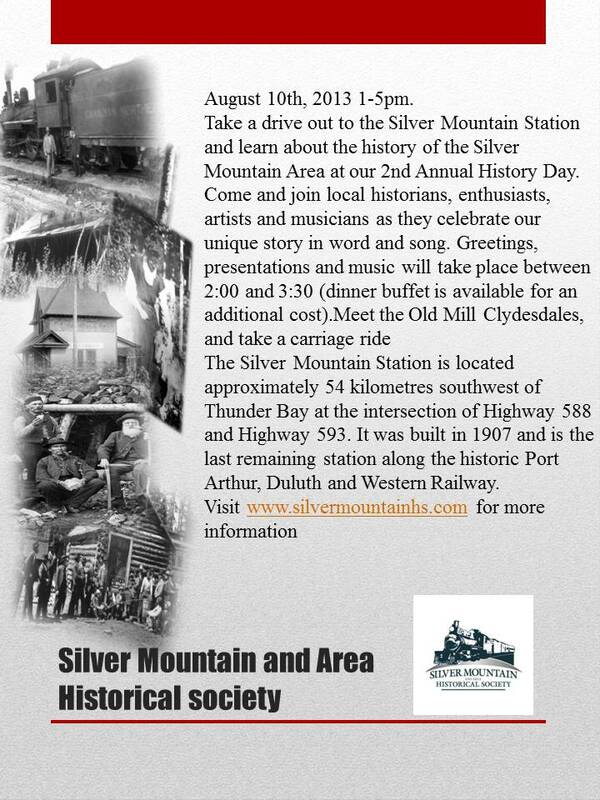 On Sunday, August 17th, 2014 the society will be hosting this great event at the historic Silver Mountain Station, located 45 minutes southwest of Thunder Bay at the intersection of Highways 588 and 593. The formal portion of the festivities will begin at 2:00 with greetings and presentations. Food and refreshments will be available, with the proceeds benefiting the society. This year’s event will feature two very interesting guest speakers. Nancy Perozzo, with the Friends of Grain Elevators, will be describing her organization’s efforts to preserve the history of those iconic structures in Thunder Bay. Bruce Kerfoot is the owner of the Gunflint Lodge in Minnesota and was born and raised on the lake. He will be sharing with us his experiences of growing up surrounded by the history and culture of the area. On Saturday, March 22, 2014 the society will be holding its annual general meeting. The meeting will take place at the Kakabeka Legion (just east of Kakabeka Falls on Highway 11/17) at 1:00pm. Current and new members are welcome to attend; however only paid members will have voting privileges. 2014 memberships can paid at the meeting. Any 2013 memberships will be carried over to the current year and all 2013/2014 memberships will expire on December 31, 2014. Highlights of the meeting will include a review of 2013 activities, a financial statement, updates on society projects and an opportunity for questions and answers. As well, the society currently has a vacancy at the position of secretary on the board of directors. Individuals interested in the position should forward their name to shelley@silvermountainhs.ca. Hope to see you all on March 22nd! 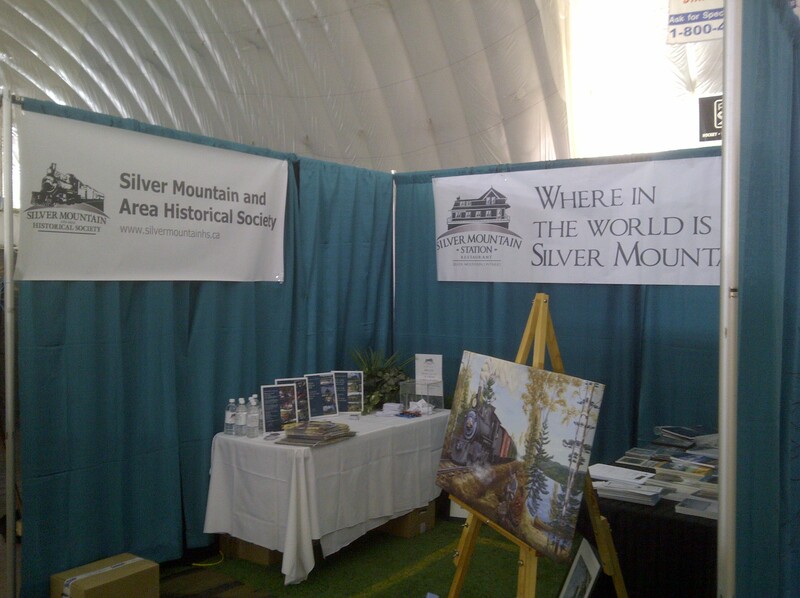 This past weekend the society made its first big public splash at the 15th Annual Thunder Bay Home and Garden Show. 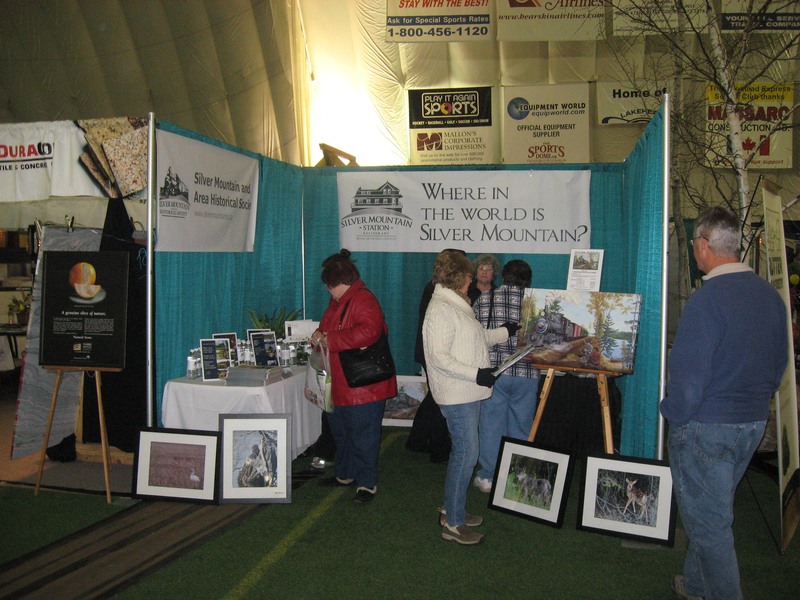 This three-day event attracts tens of thousands of visitors and was an excellent opportunity to showcase our organization. Our presence at the show was made possible through the efforts of society Co-President Shelley Simon. 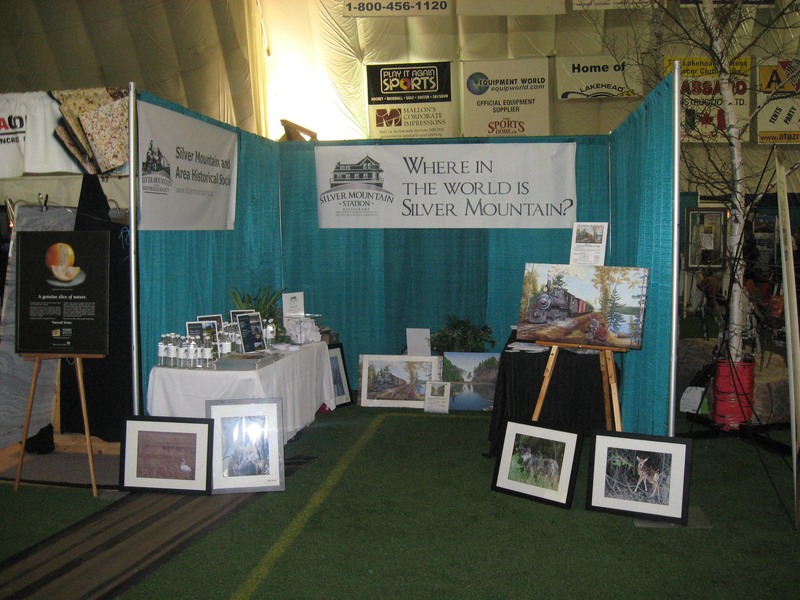 Shelley had rented a booth for the Silver Mountain Station and graciously offered to allow the society to share the space. We had a bit of a mad rush the week before to get materials ordered for this event with our new logo, such as a banner, brochures and business cards. With the help of expedited service, everything thankfully arrived well in advance, though I did have to hustle on Friday after work to get it to the show on time. Shelley, like the trooper she is, manned the booth all weekend. I joined her for a good part of the day on Saturday and society Director Kyle Duckworth stepped up on Sunday. I can only speak for the day I was there, but there was a steady stream of traffic by our location. We quickly went through our supply of brochures and had to fall back on using business cards! 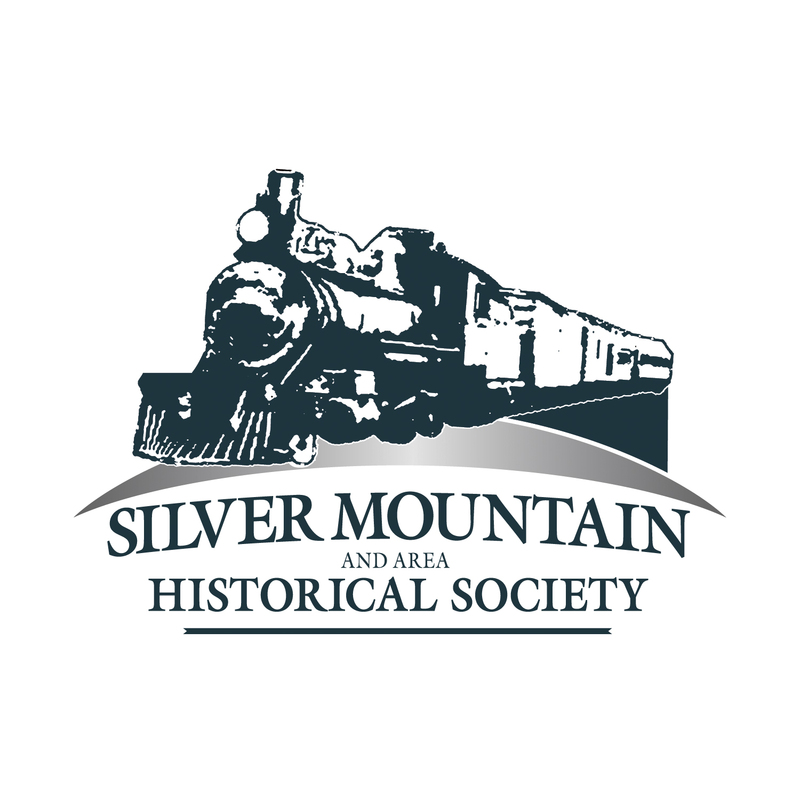 The people who stopped by were genuinely curious about the Silver Mountain and Area Historical Society, and we did get a lot of folks who were eager to share their stories of the area. If anything, the show raised our awareness in the community, especially since we are such a new organization. Hopefully this will lead to a larger membership base in the future. I’m already looking forward to our upcoming events! The society banner goes up, April 2013. 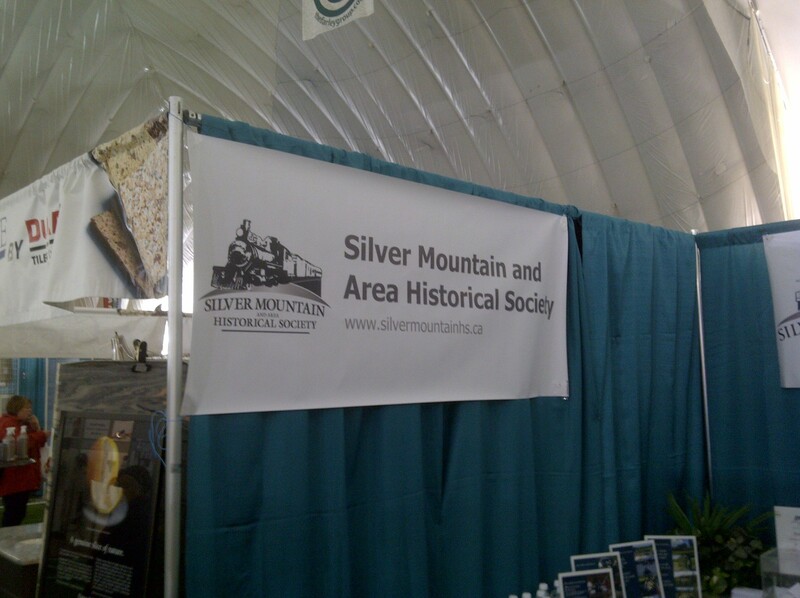 SMHS and Silver Mountain Station side-by-side, April 2013. The start of Day 2, April 2013. Visitors stopping by, April 2013. 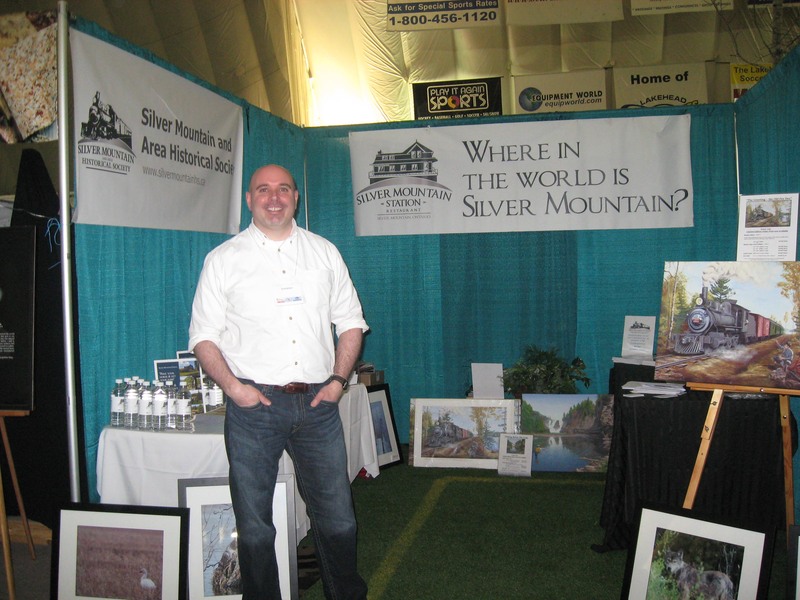 Manning the booth, April 2013. Very shortly there will be a board of directors meeting and following that, a society general meeting. This will allow everyone to be brought up to speed on society news and developments. At this time, existing members will have the opportunity to pay their dues and new registrations will also be accepted. Stay tuned for the date, time and location. It’s here! Our new logo has arrived! One of our big goals, especially since our incorporation, has been to develop a unique logo to give the society an identity. This allows us to better promote our goals and also helps us attract new members. Many thanks go out to Laurie and Kathy at The Creative Crew for helping us put this all together. When deciding on the inspiration for the logo, we had a lot of things to chose from. 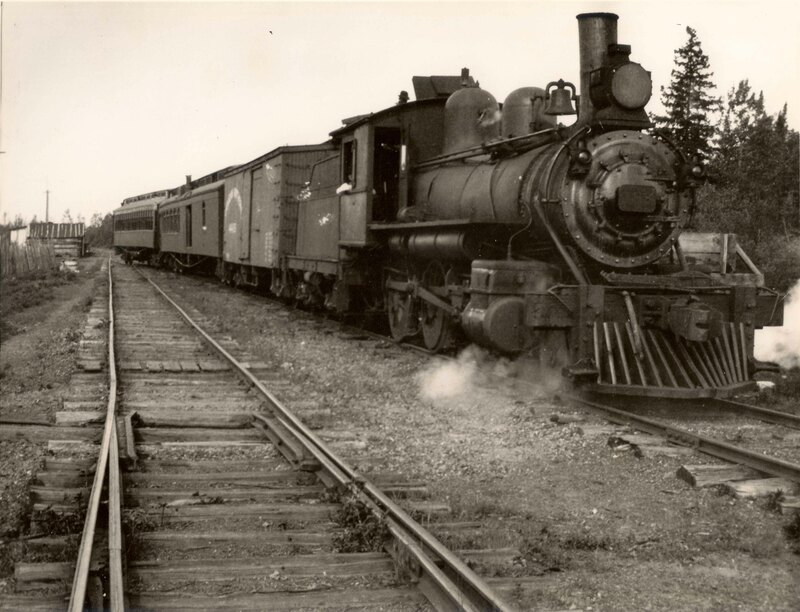 However, we finally settled on using something from the railway, since the Port Arthur, Duluth and Western -Pee Dee- Railway was such a huge part of the history of the Silver Mountain area. The image depicted on the logo comes from one of the most iconic photographs of the railway. This particular picture shows engine #108 of the Canadian Northern Railway, a 2-6-0 mogul, presumably at Mackies Siding in 1918. CNoR #108, Mackies Siding 1918. Look for the new logo at the upcoming Home and Garden Show, April 5-7 at the CLE in Thunder Bay.